The Moving Company is a unique theater company in this town of over 70 theater companies. The descendant of the beloved departed Theatre de la Jeune Lune, MoCo's productions are typically original ensemble-based creations. Like the proverbial box of chocolates, you never know what you're gonna get with them: over-the-top ridiculous comedy, lovely achingly beautiful poignancy, or more likely, somewhere in between. Their new piece Every Sentence is For the Birds falls more towards the sublime end of the ridiculous-to-sublime spectrum that they cover. The two-person show about a scientist and her subject is both simple and profound, dealing with topics no less than the nature of science and art, and what it means to be human. Words are inadequate to describe The Moving Company's work, so you should just go see it for yourself. I guarantee it's unlike anything you will see on any other stage in town. 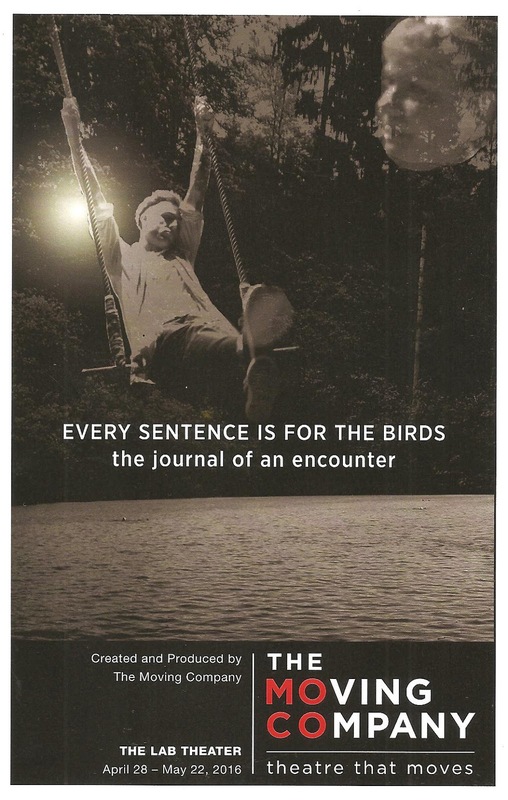 The subtitle of the play is "the journal of an encounter." And it is just that. The play begins with anthropologist Katherine (Suzanne Warmanen) speaking directly to the audience about her studies, which she considers to be a combination of science and art. She then begins reading us notes from her most important scientific experiment. She discovered a feral child (Nathan Keepers) in the woods and taught him to speak, walk, wear clothing, use the toilet, essentially she taught him how to be human. But in doing so, he taught her what it means to be human, to be a human animal on this planet. It's profound, and funny, and fascinating. The entire encounter plays out over 75 minutes or so, a brief but beautiful glimpse into these two lives. 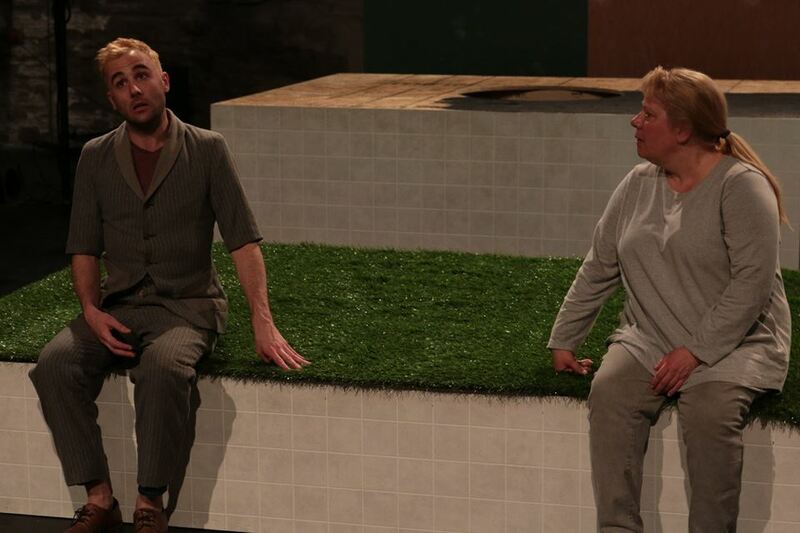 The piece was written and created by the ensemble and director Dominique Serrand, who also designed the set that's part cold clinical science lab, and part wild nature, with raised platforms of dirt and grass on one end. It's the perfect playground for these two wonderful actors to tell this story. Nathan Keepers always brings an expressive and specific physicality to his roles, but never moreso than here, creating this wild child, a performance so animalistic at first I thought maybe he was playing an ape. Grunting, bounding across the room, rolling on the floor, batting at a glass of water like a cat, as he gradually transforms before our eyes into something more human. Would I watch Nathan Keepers attempt to put on shoes for 10 minutes? Why yes, yes I would, and happily so! As the woman behind me said "he's so cute I just want to hug him!" (Really? Because all I want is for you to STOP TALKING and let me enjoy the show without your running commentary! The theater is not your living room, people! Rant over.) In contrast to Nathan's physicality, Suzanne Warmanen is an equal and opposite force. She's every bit the rational scientist, while still allowing us to see how this encounter goes beyond a simple scientific experiment. The playbill notes that the piece was "inspired by the work of Francois Truffaut, Peter Handke, Denis Diderot, and Maria Montessori." I thought Google would tell me these people were anthropologists who worked with or studied feral children, but no. They were a French filmmaker, an Austrian novelist, a French philosopher, and an Italian educator. I'm not entirely sure how all this fits in, nor the cumbersome title (although I kind of get it based on the context in which the line is uttered). But I'm quite sure that everyone who sees this play will see something different in it, and that's art. And that's why I never miss a show by The Moving Company. Every Sentence is For the Birds continues at the Lab Theater through May 22.